Sunburns aren't always avoidable, despite the abundant supply of sunscreen in every drugstore. If you forget to reapply the product or underestimate the amount of time you'll be outside, you'll be rewarded with a bright red burn that can cause considerable pain. Although you might associate acupuncture treatment with relief of aches and pains, the therapy is also very effective in relieving burns, including those caused by sun exposure. Acupuncture treatment improves your health by relieving blockages of Qi, the vital life force necessary for good health. The Chinese medical practitioners who introduced acupuncture discovered that Qi travels through the body through a system of meridians. When they inserted thin needles at strategic locations in the meridians, blockages cleared and symptoms subsided. Sunburn doesn't just affect your skin. The heat from the burn collects in energy meridians in your body, causing a variety of symptoms including pain and inflammation. 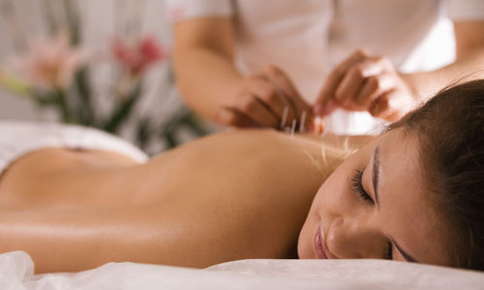 Acupuncture treatment frees the trapped heat and helps relieve pain. The Back of Your Knee. Inserting needles into this point can help remove the heat from your meridians. The Webbing Between Your Thumb and Index Finger. Your acupuncturist may use this point to decrease both pain and inflammation that occur as a result of a sunburn. The Ear. Acupuncture needles are often inserted into the ear to provide pain relief. At the Base of the Skull. This point not only relieves pain but also prompts your body to produce natural painkillers called endorphins. A clinical report published in the Journal of the International Society for Burn Injuries determined that acupuncture can play an important role in healing and pain relief for burns. The report notes that acupuncture facilitates wound healing, decreases scarring, eases pain, reduces redness and stimulates the immune system. Acupuncturists offer other other alternative medicine treatments that can help take the sting out of your sunburned skin. Herbal remedies created especially for your symptoms can help speed healing, cool your skin, get rid of toxins and reduce pain. Some remedies are taken internally, while others are applied to your skin in a compress. Your acupuncturist may also create a cooling topical cream using Chinese herbs. Applying the cream to your skin as directed will reduce itching and redness and also decrease the uncomfortable burning sensation. Did you know that the foods you eat will help relieve your pain and decrease healing time? Peaches, pineapple, watermelon cantaloupe, cucumber, broccoli, squash, bok choy, mushrooms, zucchini, and lentils are good choices when you're suffering from sunburn. In addition to eating foods that cool your skin and reduce pain, it's also important to drink plenty of fluids. Rehydrating your skin with water or green tea can reduce tightness and itching, which just may help decrease pain. Avoid beverages that contain caffeine, such as coffee, tea, and cola, as these drinks tend to promote dehydration. Alcohol should also be avoided. Acupuncture offers real relief for sunburn pain. The next time you spend too much time in the sun, call our office to schedule an appointment. We'll help you neutralize the effects of the sun with a variety of all-natural treatments.